Welcome to the February 10, 2017 edition of ACM TechNews, providing timely information for IT professionals three times a week. Researchers at Nanyang Technological University (NTU) in Singapore and Ben-Gurion University of the Negev (BGU) in Israel have launched the Bio-Inspired Agile Cyber Security Assurance Framework, a joint research project to develop innovative technologies for addressing advanced persistent threats (APTs). 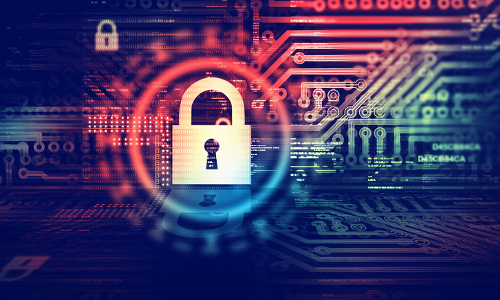 "BGU and NTU recognize the grave necessity of stopping [APTs], which are some of the hardest cyberattacks to detect, and have allocated significant funding over two years to develop early detection methods," says BGU professor Dan Blumberg. The project will receive about $2.12 million in joint funding from NTU, BGU, and Singapore's National Research Foundation (NRF). "Singapore has established a holistic national cybersecurity strategy that will support our Smart Nation vision and enhance Singapore's standing as a trusted digital hub," says NRF director George Loh. He notes the collaboration will examine novel ideas to develop cyber-immune technologies to fight external adversaries that launch cyberattacks on critical systems, similar to how human immune systems function. Researchers at Lancaster University in the U.K. have developed a prototype digital relay baton that enables friends, family, and other interested viewers to offer encouragement to tired athletes participating in challenging events, such as long-distance charity fund raising races. The prototype will be detailed this summer at the ACM Conference on Human Factors in Computing Systems (CHI 2017) conference in Denver, CO. The digital baton contains sensors that broadcast information such as location, speed, and distance data to a website, enabling people follow the action on their personal devices. Followers also are able to click on a cheer button, which makes the baton vibrate and call out the name of the person cheering so it can be heard by the athlete, encouraging them to continue. The researchers found remote followers were excited to support athletes during difficult parts of their challenge, with spikes in the number of cheers occurring on tough hills. Researchers at the University of Warsaw (UW) in Poland say they have built the first device capable of producing groups of single photons on demand, or holographic atomic memory. "In the functional sense, one can even think of it as a first equivalent of a small 'integrated circuit' operating on single photons," notes UW's Wojciech Wasilewski. 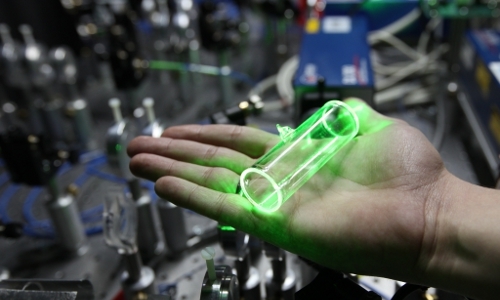 The device's spatially multimode memory core is a glass cylinder filled with hot gas vapor, which when struck by a laser pulse emits infrared-range photons. Individual photons can be positioned, stored, processed, and read in different areas inside the cylinder, serving as separate memory drawers. The researchers were able to generate up to 60 photons, and under realistic conditions they say the use of more powerful lasers would help boost this number to several thousand. The quantum memory can store photons from several to tens of microseconds; this represents a further step toward the construction of a quantum computer. Researchers at Kingston University in the U.K. will investigate how networked drones, smart wristbands, and body-mounted video cameras could enhance concert security, with a grant from the European Commission. Kingston University is one of 28 institutions participating in Europe's three-year, $16-million Management of Networked Internet of Things (IoT) wearables (MONICA) project. The university's Robot Vision team will study how drones and other video-surveillance techniques could be integrated within an Internet-linked system to expedite security agents' response to disturbances in large crowds. "As part of the project we will be looking at how wearable devices--such as smart wristbands that could be worn by concert-goers--could connect to a system developed as part of the MONICA project, which will provide [global-positioning system] information," says Kingston professor Paolo Remagnino. "That would tell you how many people are in specific places and, if there was a disturbance, you could quickly establish where it was taking place." Code.org says it could more than double the number of underrepresented minorities enrolled in Advanced Placement (AP) computer science classes in the U.S. Last year, 8,442 underrepresented minorities took the AP computer science test in the U.S., compared to 15,913 Asian students and 26,698 white students, according to The College Board. This year, with the addition of the The College Board and Code.org's new AP new computer science class, there will be another 9,083 underrepresented minorities taking AP computer science classes. The new class takes a broader approach than the traditional AP computer science class, which focuses on Java and problem-solving, by having the teacher select which programming languages they want to use. The two groups are helping 35 U.S. school districts deploy new computer science classes. The second annual Women in Data Science conference (WiDS), held last week at Stanford University in California by the Institute for Computational and Mathematical Engineering (ICME), attracted a global audience. ICME director Margot Gerritsen says the conference sought to emphasize the latest data science research, concentrating on how leading-edge companies in artificial intelligence, healthcare, and national security applied the technology. For example, several speakers noted the U.S. National Security Agency conducts mission-oriented research with big data, and they said having an advantage over adversaries requires being on the cutting edge of data science technology. The event also served as a forum for female practitioners to network and find inspiration. Many speakers stressed the need for more women to pursue data science careers. "We've gone from being a one-day technical conference to a global movement of women dedicated to inspiring the next generation of data scientists," says WiDS co-director Judy Logan. Engineers at the University of Bristol in the U.K. have developed an inexpensive, ultra-low-power computer chip that can extend the battery life of sensors more than 10-fold in some cases. The UB20M voltage detector needs only a few picowatts to activate other circuits, and in combination with an appropriate sensor it can eliminate the need for standby power by facilitating zero-power sensing and listening. 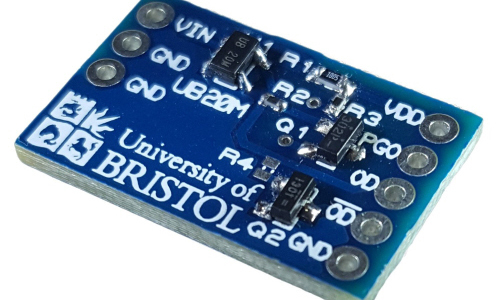 "The...voltage detector provides sensing that is continuous and free," says Bristol lead developer Bernard Stark. "This is because it is able to respond to minute quantities of power from unpowered sensors." Stark notes the chip can stay operational and in monitoring mode without needing a battery or other power, thus reducing battery maintenance or making it unnecessary. The chip consumes only five picojoules--more than 1,000 times less energy than current detectors--to generate a turn-on signal. The chip also can fit within many autonomous electronic devices. African-American technology workers receive an average $10,000 less annually than whites in New York and San Francisco, according to a survey from the Hired online job marketplace. However, the average African American is almost 50 percent more likely to land a tech job. The average white software engineering applicant usually receives an offer of about $125,000 in San Francisco and New York, while African-American candidates earn about $115,000 and $113,000 in those respective cities. Latinos and Asians are 26 percent and 45 percent less likely to find tech employment than whites, respectively, yet their average salaries are still higher than those of African Americans. 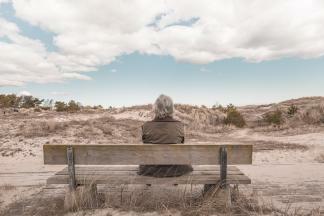 In addition, Hired found a decline in average salaries and job offers among candidates 45 and older. The survey also found companies offer an average salary of $132,000 to candidates between the ages of 50 and 60, which is about what they offer candidates who are 10 years younger. Some technology experts worry the foundational algorithms of modern data analytics systems could be more harmful than beneficial for individuals and society, according to a new Pew survey. More than a third of about 1,300 respondents held this view. The Pew report notes when algorithms are making decisions that could have major social ramifications, "humans are considered to be an 'input' to the process and they are not seen as real, thinking, feeling, changing beings." In addition, the report says experts agreed this model gives rise to a "flawed, logic-driven society and that as the process evolves--that is, as algorithms begin to write the algorithms--humans may get left out of the loop, letting the robots decide." Justin Reich, executive director at the Massachusetts Institute of Technology Teach Systems Lab, thinks a dearth of diversity in the tech workforce could be fortifying racial, sexual, and other prejudices encoded into algorithms. Researchers at the University of Bristol in the U.K. are working on the Initiate project, which aims to set up an "Internet playground" to test new kinds of Internet infrastructure on a national scale. The Bristol researchers believe an improved Internet could make a wide variety of new applications possible. "It was originally designed for basic communication like email, and now we want 4K video available to us standing on the street," says Bristol's Dimitra Simeonidou. The Initiate project will test technologies designed to make Internet connections faster and more secure, and lay the foundation for smart cities and other Internet of Things applications. "We will be connecting everything from smart cities to 5G mobile Internet," Simeonidou says. Although some of the technologies already exist, the new project will enable them to be tested at a national level, says University College London's Polina Bayvel. Researchers at the Max Planck Institute for the Science of Human History in Germany have tested the capacity of distinct computational approaches to identify cognates from huge datasets, and the best-performing technique can spot word relationships with 89.5-percent accuracy. "Contrary to the fear of many experts that automatic methods produce huge amounts of false positives we have actually found the inverse: if the algorithm says that two words are related, this is usually correct," says Max Planck study co-author Simon Greenhill. The result verifies the potential of computational methodologies in the humanities while also opening up new pathways for future research in historical linguistics and human prehistory. The researchers do not think this achievement spells the obsolescence of historical linguistics experts. 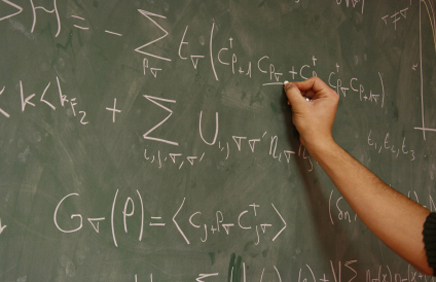 "Computational methods can take care of the repetitive and more schematic work," says group leader Russell Gray. "In this way, they will allow experts to concentrate on answering the interesting questions." Facebook's Lumos computer-vision platform is driving image content search for all users, enabling queries for Facebook images using keywords that describe photographic content. Facebook researchers achieved this by training a deep neural network on millions of pictures, so it could match search descriptors to features taken from photos with some degree of probability. Once it has matched terms to images, the model ranks output with data from both the images and the original search. The addition of weights to highlight diversity in photo results reduces the likelihood of yielding numerous images of the same object. Facebook says the technology could be used in both a commercial and a personal context, while a planned update to its Automatic Alternative Text tool could assist visually-impaired users by better relating actions to objects. Facebook trained a computer-vision model to identify actions occurring in photos by labeling 130,000 images pulled from the platform. Researchers at the Kaunas University of Technology (KTU) and the Lithuanian University of Health Sciences in Lithuania are developing GRIUTIS, a monitoring system that can alert medical professionals if an older adult suffers a fall. The research team has created a prototype of the system, consisting of a set of fixed sensors placed in the home and specially designed software. When the sensors register a change in a person's behavior or in their position, the alert is sent to their family or caregivers. The researchers say the GRIUTIS system could be used in geriatrics clinics as soon as next year. "I tested the prototype at home myself," says KTU professor Egidijus Kazanavicius. "It works perfectly, and I feel more relaxed knowing how my elderly mother is doing when I am not nearby."